Frazr, son of "Lucy"-Ch Niedleich In Vogue.& "Oscar" Ch Dyric Propensity. Frazr is an exceptional young dog, correct size, well boned, strong head, excellent movement with the correct banded coat. 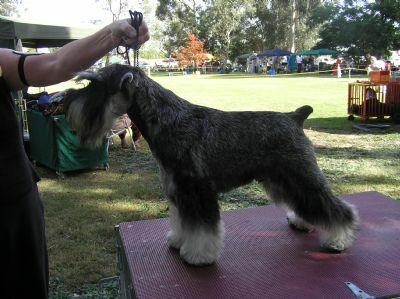 Frazr was shown sparingly in 2004,but achieved Baby Puppy in Show,Maryborough Judge Mr.K.McCarthy. Baby Puppy in Show Schnauzer Club of Adelaide Open show. 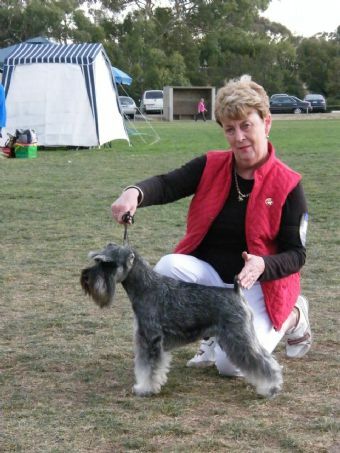 Baby Puppy in Show Schnauzer Club of Vic. Judge Mrs.F. Krall U.K.
Frazr has only been out in 2005 since mid Feb,05, and has twice won Puppy in show, and 6 puppy in group placings. He's an exciting dog to watch, and a pleasure to live with, with the most outstanding personality and temperament. Watch out for Frazr around the rings in 05. Judge Mrs. Maureeen Boyd (New Zealand. Critique:- What a quality dog. Balanced,excellent type, presented and moved well,excellent expression. COMMANDED THE RING.